I have a few parts laying around, and I didnt want them to do to waste. Is there a better use for them? No, I dont think so 🙂 So, I want a spider quad. I cloned a TBS disco once , but I crashed it.. in the middle of the road… right in front of a car… stupid is what stupid does, right? I have grown up since, and also learned quite a lot. Don’t fly near populated areas, dont fly over people, dont spy on chicks (there’s a hen farm nearby), if your going to use GPS, check solar flares, tighten those props, bloated batteries are not OK… oh yeah, NEVER fly near an airfield. I knocked up some flying time and haven’t crashed since. Well, that went offtopic quickly hehe. I present Custom quadcopter with cleanflight, Part 1. I love the looks of the Spy Hero quadcopters. Im not keen on spending a few hundred bucks just for a frame, so i decided to do it myself, a custom quadcopter, based on SkyHero frame. I googled for pictures of that frame, and made a couple of drawings. I wanted to make the frame out of FR4 with integrated PCB, but with the price of copper clad…. I might as well buy the frame. The upper and lower plates are rotated 90 degrees, so the frame doesn’t twist that much. I also coated everything with epoxy resin. It’s what I had at hand. It turned out pretty rigid. 4x 30a ESC with BLheli or SimonK, not sure yet. The wiring harness was routed inside the frame, so it wont end up messy at the end. 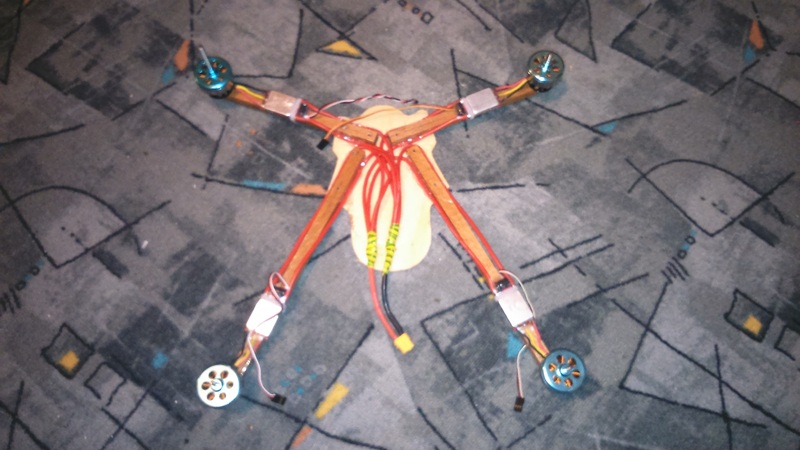 Motors are soldered directly to the ESCs, which are mounted on the booms. I figured they would get hot inside the frame.